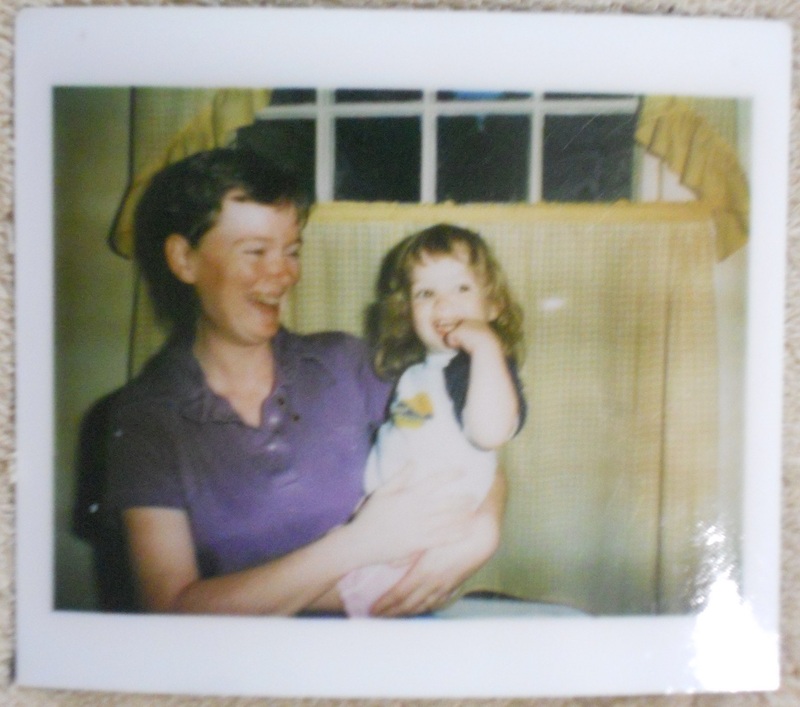 My mom (pictured above with baby Megan) was an artist. She loved doing arts and crafts projects with my sister and I. She got into candle-making, wreaths, cross-stitch, chocolate molds, and more. 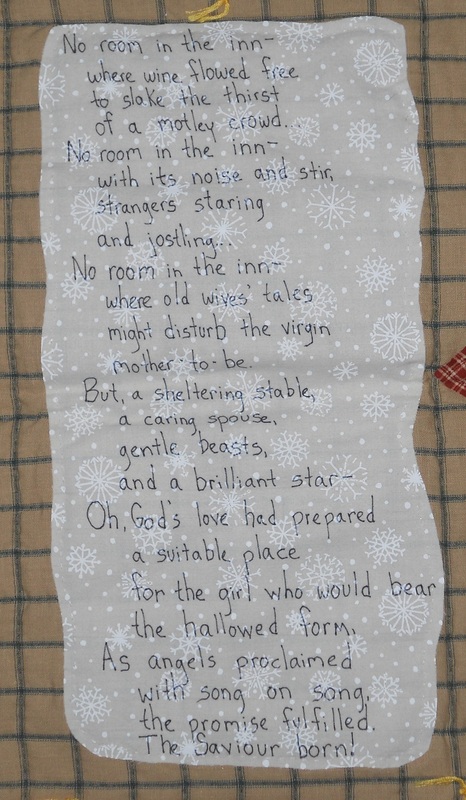 But her real passion became quilting. 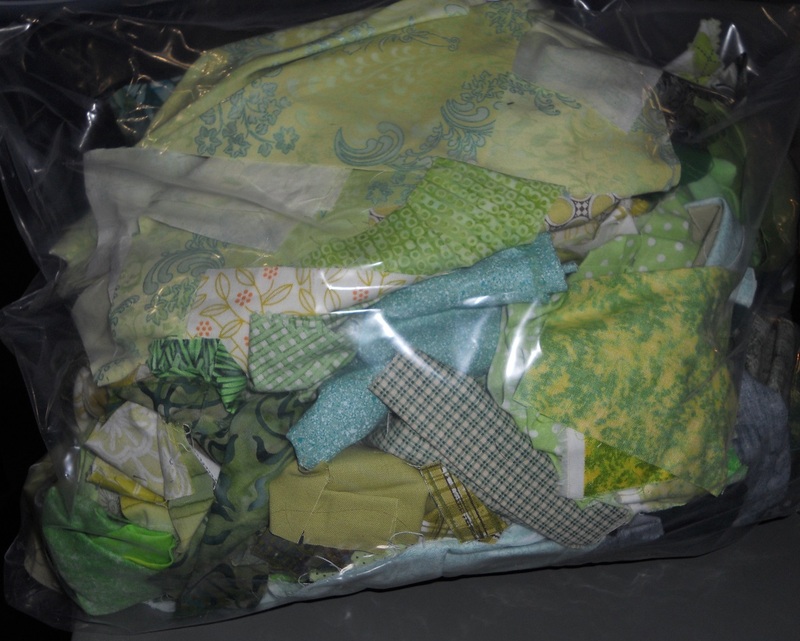 In the few years that she was a quilter, she made dozens of quilts. Most were given away to friends and family. I have a few. So in honor of mother’s day, here are some of her works of art. Along with being an artist, Mom was a lifelong learner. 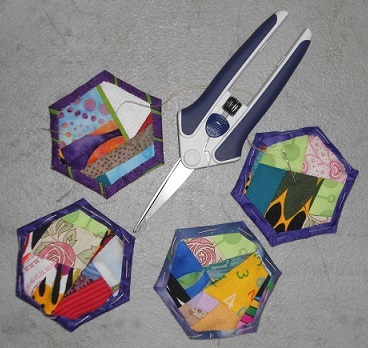 This was great for quilting because there are so many techniques available! 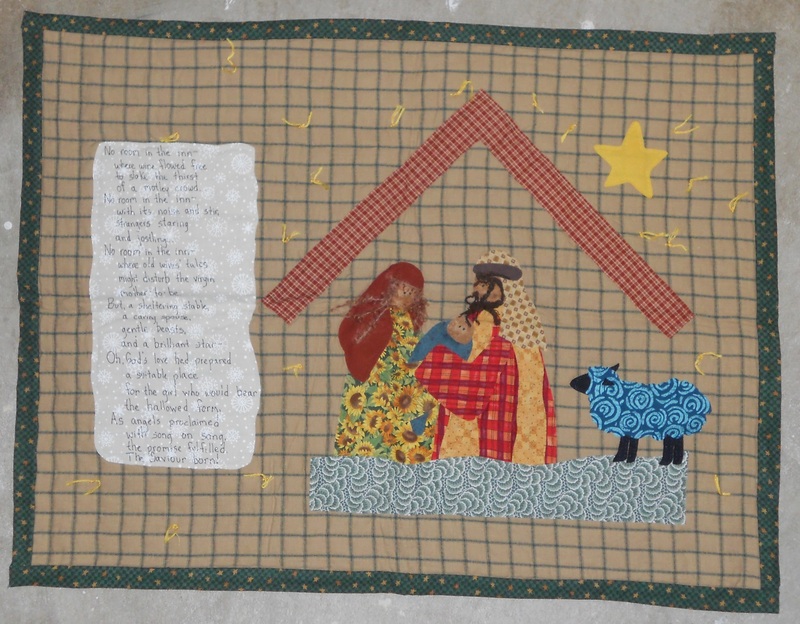 The Christmas wall-hanging above was made with fusible webbing and tied. Years later, I hand-sewed the shapes down that were starting to peel away from the backing fabric. I love the message of this poem. Sometimes what seems like a bad thing is really for the best. I also love that it’s in Mom’s handwriting. She kept her lines straight using a light-box. Lit from behind, a lined sheet of paper was placed underneath the white fabric she wrote on. Smart! Here’s another one that’s mostly fused. Mom machine quilted between the blocks and in the borders on the machine that I now use. It’s the one I learned on and inherited. 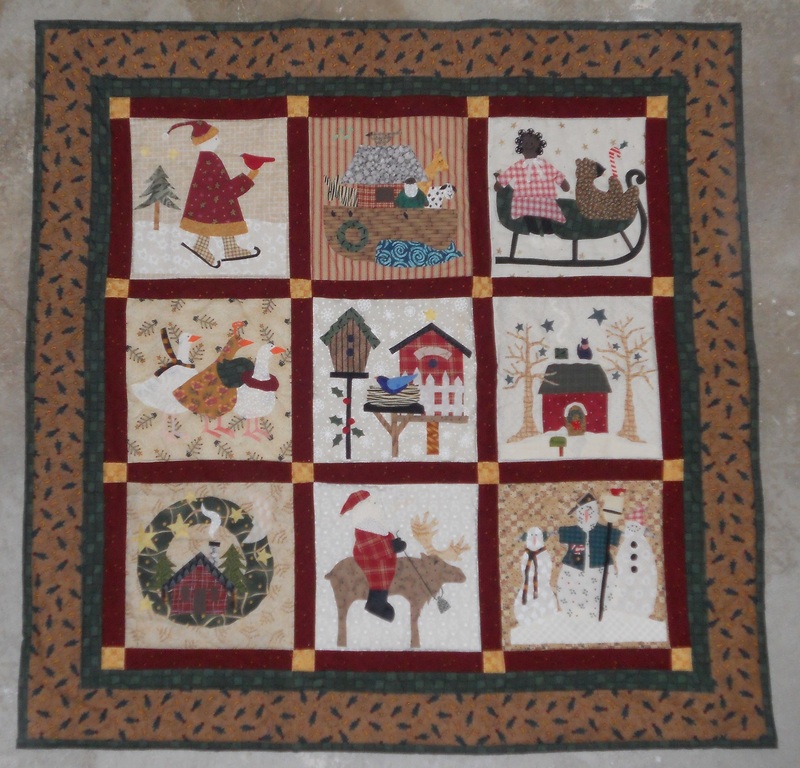 This quilt hung above the fireplace in our last house. It’s a Christmas one so I intended to take it down in January the first year we were there. My husband and our housemate liked it so much they asked me to leave it up a bit longer, and that was its home spot for all the years we were there. Another thing to point out about this piece is the skin tones. Can you see it? Mom put in different colored skin tones not only to be realistic, but also to honor her love of people from lots of different backgrounds. Even though we lived in a mostly-white Connecticut town, she her book-club, church, and quilting friends had all different skin tones. And stories. I felt so grown up when I was allowed to join their conversations. 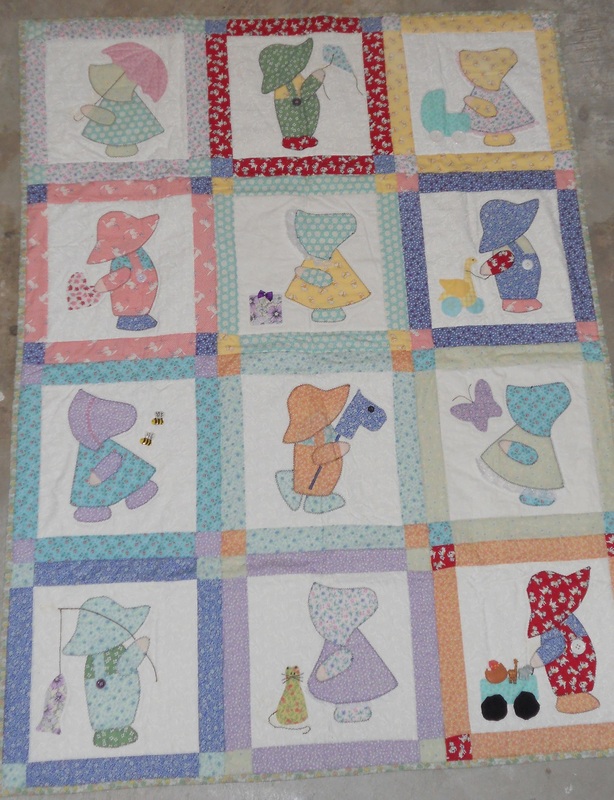 I took a Sunbonnet Sue and Overall Andy quilt class with Mom. She ended up with this beautiful quilt. I ended up quitting halfway through because my applique skills were frustrating. This was machine appliqued using a zig-zag stitch and invisible thread. 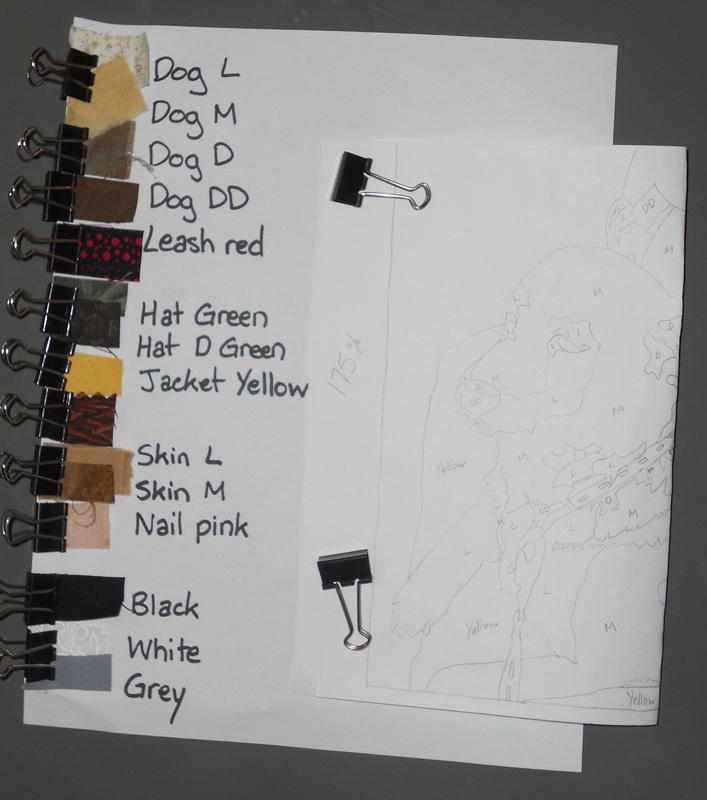 I wanted mine to look like the sample, which had perfect tiny black zig-zags. 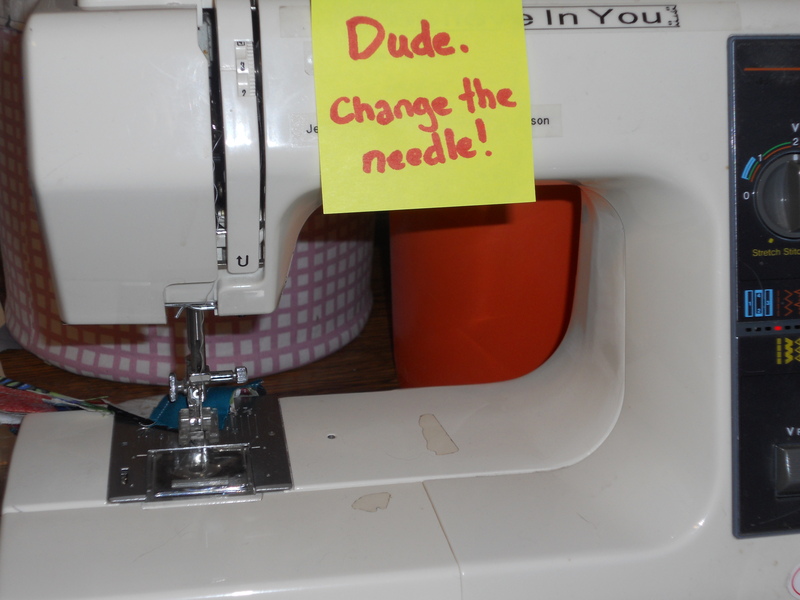 Yeah, black thread isn’t such a good idea for a thirteen-year-old. I remember helping Mom decide what each character would be doing, and helping her find the embellishments. Sue’s running from bumblebee buttons. Andy’s pulling a wagon with yo-yo wheels. 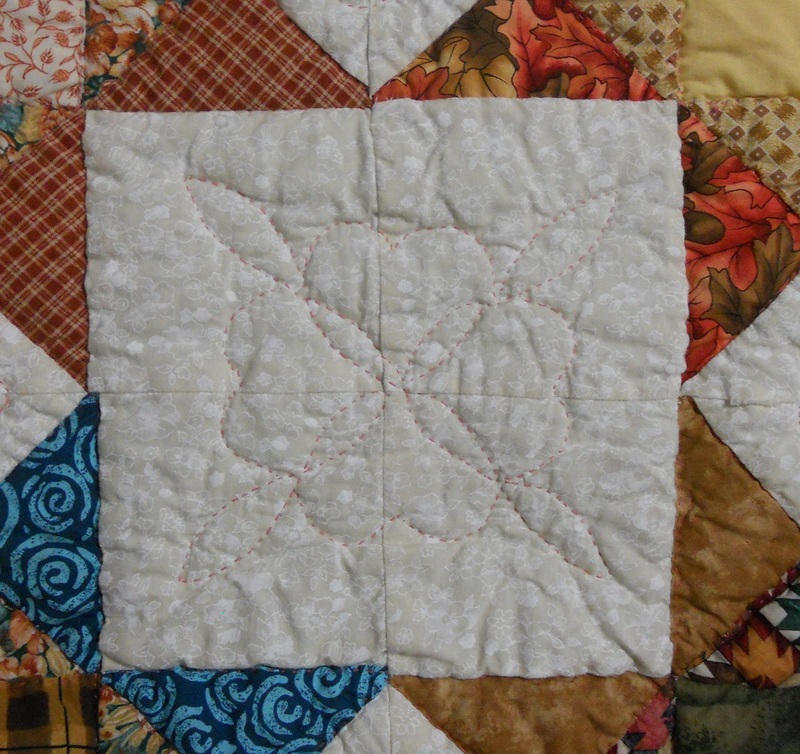 By the time Mom started churning out more quilt tops than she could finish, I my interest in quilting had dimmed. I’d rather be talking on the phone with my best friend for hours, waiting for the radio to play my favorite song ever, deciding which shirt would be best to wear tomorrow, and other teenage girly things. I do remember picking up a few pieces from the long-armer and being amazed at her huge machine. It took up the whole room! I wish I knew that woman’s name now, so I could add her to the label. 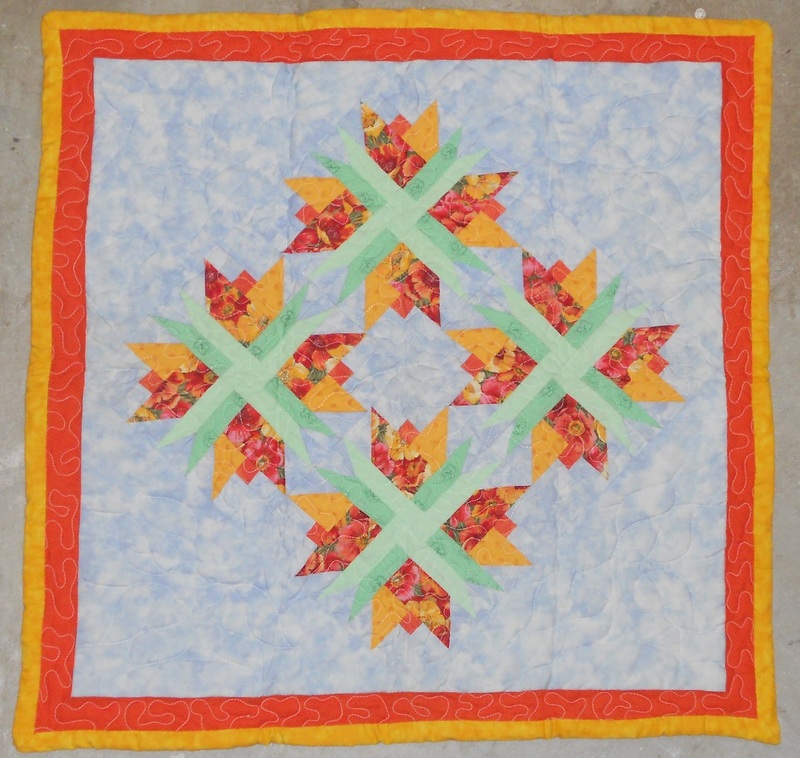 This tulip quilt was one of the first to be sent her way. Okay now we’re into the baby quilts. 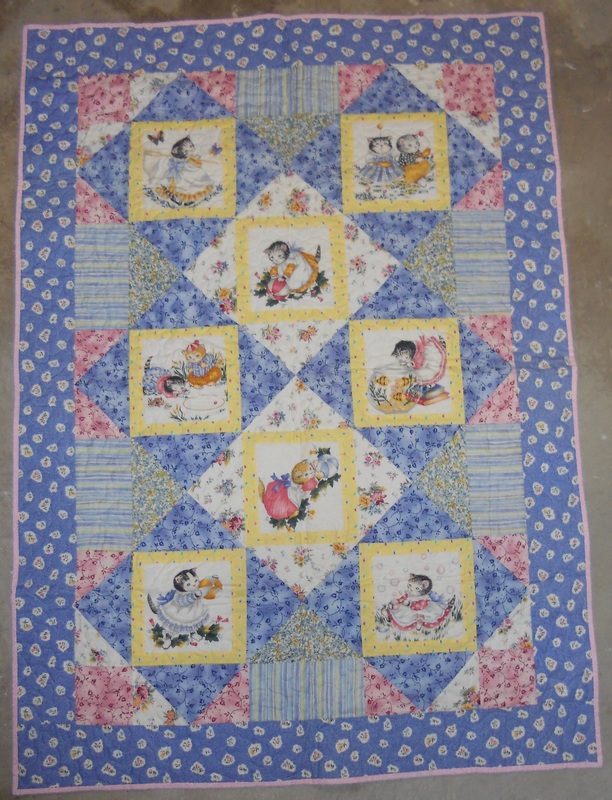 My parents decided not to learn the gender of the baby, so there are a few quilts with both blue and pink as my Mom wondered. They picked out two names, one for a boy and one for a girl. James Patrick won out as my brother Jimmy was born. He’s shortened it to Jim and made his way to prom last weekend. Ho boy has he grown up! 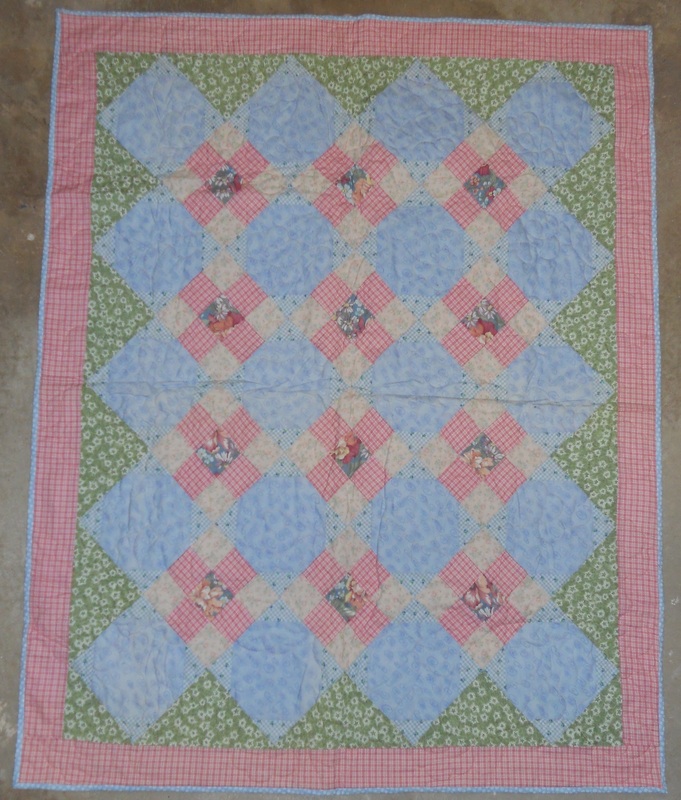 There’s at least one more baby sized quilt I’m holding onto until my brother’s ready to have them at his own place. You know, when he’s old enough to have his own place. It’s a grandmother’s flower garden, paper-pieced and beautiful. 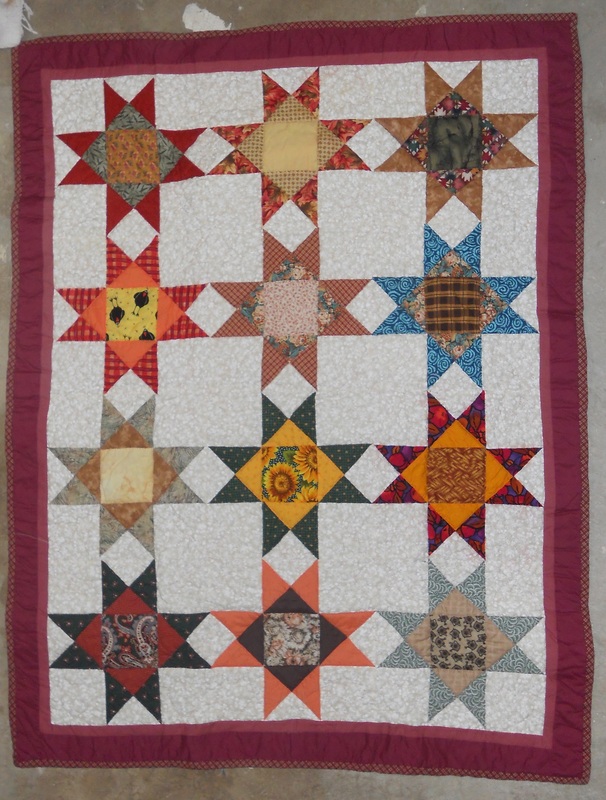 The last quilt I’m showing you today was made after Mom found out that her colors are Autumn inspired. (Remember this post? I’m an autumn, too!) She didn’t have a lot of fall colors in her stash or quilt collection so she challenged herself to make this one. When she passed, it was only a top. 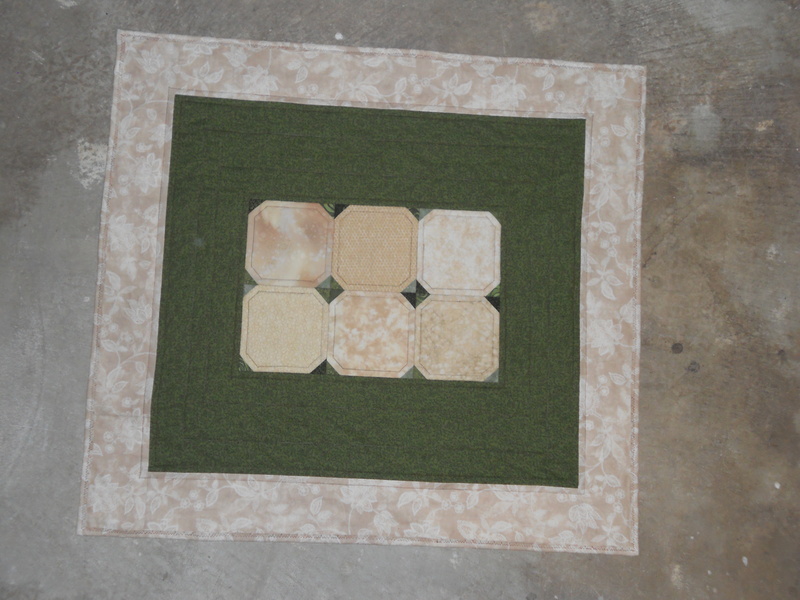 So her friends in the local quilting group finished it… by hand. 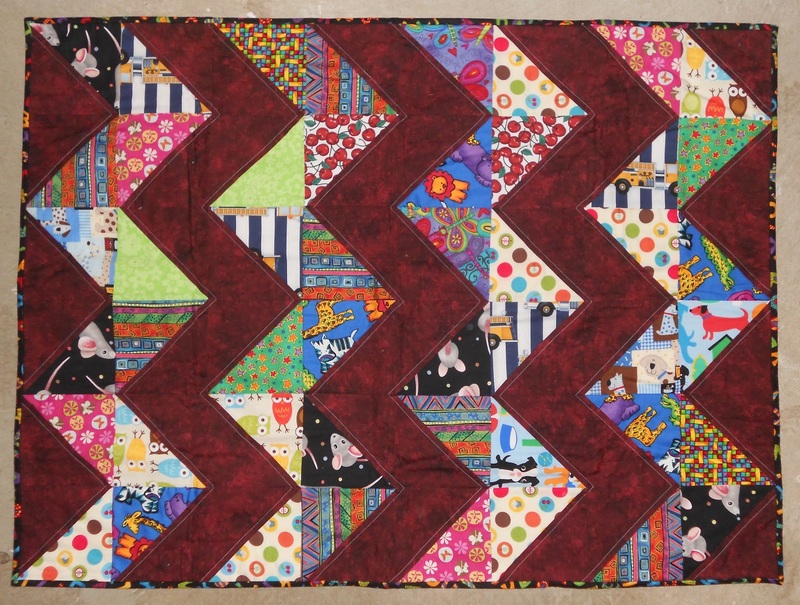 Look at this beautiful hand quilting in-between the stars. It’s dedicated to the baby. Such a work of love it takes my breath away just to look at. Happy Mother’s Day to my mom, and all the mothers out there. All of this information is recalled from memory. Just know that even when your teenage daughter is rolling her eyes at you and answering every question with “fine” that they’re probably still paying attention. I was. This entry was posted in Applique, Art, Collaborations, Quilt Guild, Quilting the Quilt and tagged artist, learning new techniques, Mary, mom, mother, mother's day, portfolio, quilt classes, quilting, show and tell, teenager, trunk show on May 4, 2014 by quiltartbymegan.